It’s a fast-paced world, and sometimes exercise and meditation fall at the bottom of a long to-do list. 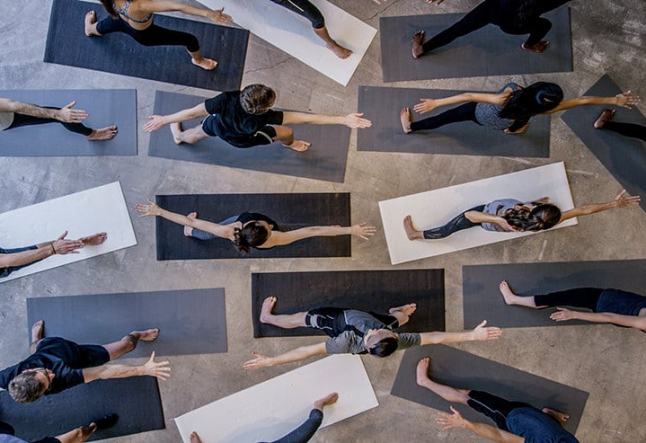 If you love to do yoga but sometimes have a hard time making it to your local studio, a variety of yoga apps are available to help you get your practice in. Download any of these apps to your mobile device and get started! YOGAmazing is a yoga studio in your pocket. Use the 25 mix-and-match mini classes to create your own yoga session. Exercises can help you lose weight, build muscle, gain flexibility and help work through anxiety or stress. Chaz, the creator of the app, designed the exercises for beginners as well as veteran yogis This app has varying poses to keep you from getting bored during a session, too. If you fly a lot, Airplane Yoga is for you. These easy, seated poses are perfect to keep your body stretched and relaxed. You can adapt these poses for car travel as well. Yogify has a lot to offer in one download. There are more than 35 hours of yoga practice and 250 poses to try. Choose from strength, balance or flexibility routines and set your skill level. Before you start a class you can go through the poses frame by frame to preview the movements you'll be doing. The teachers in each video give step-by-step instructions to ensure you move through the steps properly. Another great feature is the playlist option; either listen to the teacher-selected playlist or play your own quietly in the background. Classes range from 15-45 minutes in the initial download, and then you can purchase additional classes if you want more. Start your day off right with Yoga in Bed. Once your alarm goes off, sit up and get started. This app offers quick, easy exercises to get your body stretched and your mind on a positive path for the day. All you need is 15 minutes in the morning. This app is great for anybody who struggles to wake up in the morning. You’ll get the boost you need to get motivated and moving. A note about the tech. Pairing technology and exercise is easy to do with all of the options available on the marketplace, but if you can avoid it, don't use these apps on a tiny smartphone. Allow yourself a bigger screen to better see the teacher and his or her movements. Try a tablet with at least a 9-inch retina display and lots of battery life. Don’t sacrifice your mental and physical health due to time and schedule restraints. You can easily fit yoga into your day with the help of any of these apps.